You know that bit on my web page…? What are the parts of my website called? Hey don’t worry! 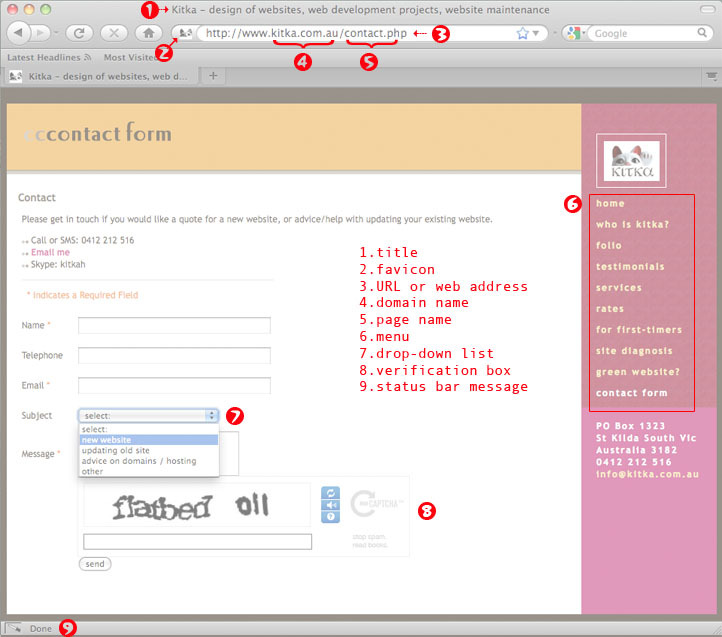 Many people have trouble properly identifying elements of a webpage. It’s hard enough keeping up with technology without having to learn what everything is called… But it does help when you are talking to your web designer to know a thingamy from a whatchmacallit. This code appears right at the top of your browser and is saved when you make the page a ‘favourite’ or ‘bookmark’. It is also important in your search engine rankings so it is good to include your keywords in the Title. This is a tiny image that can be used to brand your web address. It is also saved by most browsers when you make the page a ‘favourite’ or ‘bookmark’. This is the entire address of the web page from the http to the end. Sometimes it can be ridiculously long. This is the bit that comes at the end of your URL and identifies the specific page you are looking at. It usually ends in .html, .htm, .php or .asp but on some sites it is not visible at all. The menu can take many forms, be horizontal or vertical and can incorporate sub-menu items that ‘fly out’ or ‘drop down’ but it is basically a list of where you can go on the website. These lists are generally used in a form where you have a number of list items to choose from. It can be used as a menu (particularly useful if you have a huge choice of pages) and it can be styled to look nicer. This often overlooked part at the bottom of your browser window will let you know if your page has loaded properly or if there was an error, and it also will give you a preview of where you are about to go when you hover over a link in the page. This is a hidden tag used to describe an image. The Alt Tag is displayed on the page if the image doesn’t load properly for any reason, so it is handy if it is a proper description of the image. In Explorer you will usually see the text of the Alt Tag when you hover your cursor over an image. A hover title is another hidden tag that will display when you hover your cursor over an image or link, however the Hover Title works in all browsers, so if it is important to explain what an image or link is, it should be added. The two main meta tags are for the ‘Description’ and ‘Keywords’. These tags are only visible if you view the web page source code and are read by search engines and have some apparently minor bearing on your rankings. There are suggested limits of 100 characters for the description and 20 keywords. Slideshows (great for cycling through photos).